This is the quilt Kasey,our granddaughter, made for her boyfriend. 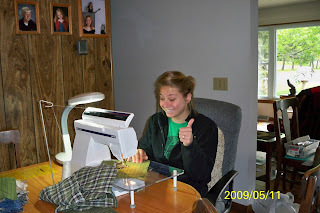 The first picture is Kasey sewing the quilt at our house and giving a thumbs up. The second picture is THE QUILT. This was the first time I got to see the completed quilt and I was pleasantly surprised how beautiful it came out. I would say her boyfriend is one lucky guy. Good Job Kasey!!!! !